The Vogalonga in and around Venice is the most colorful and exhilarating event I have experienced in a long time! With more the 1,500 boats; gondolas, canoes, rowing sculls, rowing barges and kayaks, there must have been thousands of participants. Giorgio Sartori, Kristin Nelson and Jennifer Kleck, and I launched our Point65 kayaks and paddled past the tall stone buildings and the gondolas through the city to meet up with a few other paddlers near the “Bridge of Sighs”… paddlers from the Netherlands, Croatia, Australia, Serbia and Sicily, Venice, Denmark and Switzerland. Of course we paused for espresso on the way... here is Giorgio ordering. We tethered the kayaks outside. Starting near St Marks Square at the end of the Grand Canal, the race loops around the lagoon visiting towns on other islands, including Borano, a lace-making center where all the houses are painted in different colors, and Murano, known for its glassmaking. We stopped for a snack and espresso at Burano before finishing the route as far as the western entrance to the Grand Canal where we found the way still blocked by boats at the bottleneck created by the first bridge. Paddles and oars tangled and clashed as the current pushed the boats back. The final part of the route follows the Grand Canal back to St Marks Square, past magnificent frescoes and mosaics, wrought-iron and marble facades. 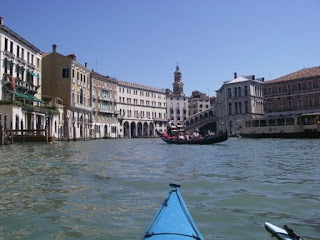 To either side we caught glimpses of narrow canals with steep stone bridges between tall buildings, with dark gondolas creeping along. I was delighted to see people of all ages in every kind of paddle-powered craft taking part, some in costume and flying huge flags, others simply using whatever craft they could get hold of to use. There was a great sense of community. We dodged around taking photos, and sprinted forward or drifted back to see a particular boat more closely. We will be in Italy for another week, teaching classes at nearby Bibione at the Capalonga campground, where the First Italian Sea Kayaking symposium will be held this coming weekend, 16-18 May. Come and join us! And then next year? We’ll certainly be coming back! Check on my web-site www.nigelkayaks.com in a few weeks time for more details of this trip and also to find out what is planned for 2009! It snowed in Seattle the day I flew to San Diego. April showers of snow for a few days while I endured the salty Californian air, played in the waves with VCP rep and fellow British transplant Sean Morley, and joined Jennifer Kleck for her sea kayak symposium in Mission Bay. Then… the first Point65 Whisky16 sea kayak to see North America arrived by truck from Los Angeles, having been specially flown in from China. It’s my latest design. I was excited to see it but sad to find it had been squished beneath something heavy. Jake tenderly nursed it to health with his healing hands and a fiber-glass repair kit, so it was on the water by Saturday afternoon… Jake was the first person to paddle one in North America! Sunday evening Thom and Lynn invited all the coaches for a wonderful dinner at their home, followed by double-shots of espresso... and fine 16 year old Lagavulin single malt in celebration of the Whisky16! And next day we all crossed the border to play around the rocks of the Mexican Pacific coast; it was a real delight for me to use my new W16 in fun conditions and to hang out with my buddies! Thank you Jen for putting it all together and saving me from the Seattle snow! For more symposium images check out Michael Franklin's site! Yes, it's the time of year when places in the south appear more attractive than those further north! Late February is when Sweetwater Kayaks hold their annual sea kayaking symposium, and that gives me the excuse to visit Russell and Claudia, and Jean Totz and to meet up with friends from across the country and from across the ocean! The BCU (British Canoe Union) is grappling changes imposed by UK government, and one interesting result is a shift in focus bringing an upsurge of interest in canoing.... that's "canoing" of the North American meaning, not the "canoeing a.k.a. kayaking" of UK usage. I'm pleased because I've always enjoyed canoes and finally had the opportunity to use them in Florida this winter! As Steve MacDonald and Phil "4th of May" Hadley from UK began stitching canoe skills into the US kayakers, it was fun to see all manner of American kayaking coaches on their knees for a change, freeing themselves of white "kayakers legs"! Apart from single-bladed paddlers at the event, there were the usual narrow double-blade contingent (ably aided by world-class instructors Greg Stamer, back from circumnavigating Iceland last summer, and Cheri Peri and Turner Wilson). Plus there were the usual "we're here to have fun and get wet in warm water!" contingent, learning to stand up, or to roll, or to laugh outside the box (a place where I typically hang out), and a crowd of paddlers steering their way through the changing levels of BCU certification. I didn't see many long faces. After the symposium I lingered longer to paddle with Swedish friends Roland and Britta (who coordinate my annual trips/courses in the Stockholm archipelago), Seattle photographer Joel Rogers, and of course Russell and Claudia. We skipped around the local rivers seeking manatees, alligators, turtles and roseate spoonbills, hiked a couple of places and watched Russell's band at a gig in Dunedin... Florida is always synonymous with music for me, jamming with Russell and other friends, checking out used guitars at "Legends" in Tampa or heading out to to a live concert. An amazing number of my kayaking friends are talented musicians! So, now back in sunny Seattle, I'll be wondering where the warm went until the next trip south... to San Diego for the Aqua Adventures symposium and some fun in the rock gardens of nearby Baja Mexico! Will I see you there? Wednesday evening I gave a slide presentation at the WAKE kayak club (at Bellingham Wa) about kayaking in the Faroe Islands. (“They said the Faroes were in Egypt”.) I was sad to hear of a local paddler who died recently. He was a member of the paddling community if not of that club. WAKE is very safety aware and so everyone took note to see what could be learned. I gathered he was paddling at dusk on a surf-ski, had tipped into the water and become separated from his ski by the wind. By chance another paddler on a surf-ski came by and tried to retrieve his ski for him. He too spilled, and had difficulty climbing back into his seat. By that time in the dark he could see neither the swimmer nor his craft. With his VHF radio he called the rescue services which found the stray kayak but at first could not see the swimmer. When he was eventually spotted and rescued, it was too late. Sadly he died. Without going into his situation in detail, I thought I might pick up on a few factors that could be of help to others. I’ll focus on surf-skis although most of the points apply to any kayak. I’ll choose just six; there are many more; please feel free to post your own favorites here. 1. Surf-skis generally float well, don’t swamp, yet are lightweight and are easily blown. They blow away more rapidly than capsized sea kayaks, and often more quickly than you can swim. Race craft built for light weight, they often have little in the way of deck-lines or grab handles, and can be slippery when wet. Consider a tether of some sort so you can keep contact. Some surf-ski paddlers tether their paddle to the ski, so if they keep hold of the paddle they have a way to get to their ski. Wave ski paddlers, riding surf waves, make use of an ankle tether which attaches to the ski so it does not get carried to the beach in event of a spill, and this could work well on a surf-ski too. 3. If you’re swimming in windy choppy conditions, the chances are against anyone hearing your calls for help. Carry a marine VHF radio, and learn how to use Channel 16 in case of an emergency. With a radio you may be able see and direct searchers straight to your aid even before they can see you. 4. Wear an appropriate PFD (float-vest). Make sure it's the right size, fits correctly and make sure you’ve fastened it correctly. 5. Wear clothing suitable for where you are going and what you could end up doing. Shorts might seem fine for what you first intend to do, but if you could spill into cold water, or you could end your trip wet and in a chill wind, it’s best to dress for those eventualities. A dry-suit is great, but its insulating properties in water are only as good as what you wear inside it. Check for yourself how warm your clothing actually is from time to time by floating around in the water by the shore after paddling. 6. Finally; a few pointers about strategy. It’s easier to get to shore if you are close to it. It’s usually easiest to paddle straight into the wind. It's harder to control a kayak down-wind. It is much more difficult to turn around, and unstable when you are side-on to the wind and waves. In a tippy kayak your easiest and safest route might be from A to B along a shore directly into the wind. Think about it; you don’t want to fall into the water far from shore with an offshore wind while trying to turn around. You don’t want your first rough-water attempts at climbing back on in deep water to happen when you are by yourself in cold water at dusk. Practice your techniques in a safe place! It’s generally safer to paddle with a companion, and a good idea to tell someone responsible where you are going and when you expect to be back. Figure out your strategy to make it easy to stay alive! Most safety advice is “common sense” when you think about it, but sometimes you don’t think about it till afterwards. The real skill is anticipating events that might happen and figuring out possible strategies to deal with each of them. Preparation includes gear, skills and awareness, and should also include a “get-out clause” so you can turn around and go home without getting wet whenever you don’t think you have all you need to be safe on a particular outing. 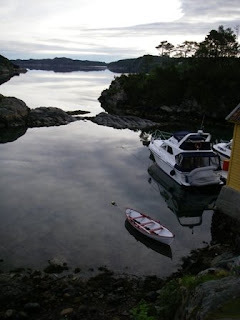 You can find a lot more safety tips in my book "Nigel Foster's Sea Kayaking", Globe Pequot Press.